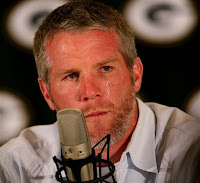 Are you as sick of the Brett Favre stories as I am? He's at the end of a long career, can no longer do what he used to do, fades towards the end of the season, and yet he's still a story. The constant retiring and un-retiring is covered in the press as indecisiveness, but it appears to me that he simply doesn't want to have to go to training camp. Maybe he thinks he's above it or something. Either way, although he's free to do what he wants, I'm tired of hearing about it.